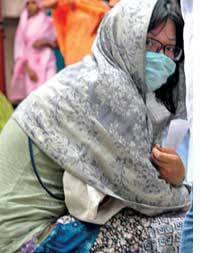 fifteen-year-old Preshita Padhye tested positive for H1N1 virus on July 27. She spent the next five days at the isolation ward of the Aundh general hospital in Pune. "Seven of us were in the ward, including two adults," she said as she recalled the horror of the first night. "A girl next to me vomited. I called the nurse who asked me to take the girl to the toilet. I called the ward boy but he was drunk. Instead of cleaning the floor, he shouted at us and left." The hospital, she added, was a mess. "The toilet was dark, there were no lights; the commode was choked and dirty water from the toilet almost reached up to my bed." Besides, the ward was hardly isolated--people, her parents included, could walk in anytime. "I have never felt so helpless. I shudder at the thought of leaving my daughter in such an unhygienic place.I had no choice," said Sudhir Padhye, Preshita's father. "Not one public hospital in Pune functions properly," said Abhijit Vaidya, cardiologist and head of Arogya Sena, a campaign on disaster management and public health. "The Naidu Hospital (a public hospital in Pune) is hell. People have no faith left in the country's public healthcare system. Parents would rather not take their wards to such hospitals." It was only after Preshita's father informed local media of the hospital's condition, did the administration take action. The hospital's walls were painted overnight and floors wiped clean. Another factor contributed to the authorities taking swift action senior health ministry officials from Delhi and Mumbai were visiting the hospital. 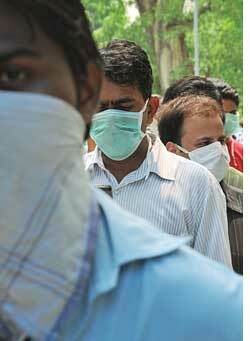 The first case of swine flu in India was detected on May 13. This was 20 days after who sounded out the virus' pandemic potential. India claimed it was well equipped and prepared. The fact is several states started taking measures only in August. Assam's health department trained 100 doctors to deal with the pandemic on August 11, for which the Centre released Rs 15 lakh. The state's health minister assured the people Assam was prepared to tackle the epidemic as 38 beds had been made available. 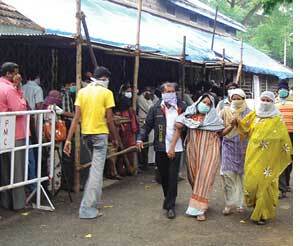 In Orissa the eight-bed swine flu facility at the Capital Hospital in Bhubaneswar was in disarray. The facility, two beds each in four rooms, was dirty and emitted foul odour. Kabita Baral, the nurse on duty, said the facility was created in the first week of August. Within a week they had to shift to a more spacious part of the hospital that could accommodate 10 beds. Nagpur waited till the situation aggravated in Pune. 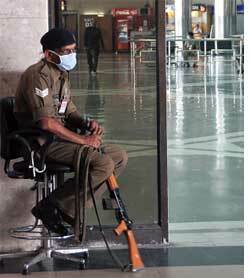 The government deployed two doctors at the airport. But swine flu could enter the city through the Maharashtra State Transport bus depot; the state didn't make any screening arrangements here. Private bus services that operate at different points in the city were also left unscreened. India was not ready for the number of test samples either. "In the past three months, we received 50-60 samples a day; of late, it has gone up to more than 400 a day," said A C Mishra, director of National Institute of Virology, Pune. "We received 500 samples on August 9. From 24 hours earlier, it now takes 36 hours to declare test results." Health activists said the panic was the government's making. "Those with mild flu symptoms don't need tests. Official notices direct people to visit designated hospitals if they are suffering from cold, cough and fever. By this standard, half a city's population will have to be tested. "I was in Agra when I came down with fever. I have been feeling very weak so I came for screening. The doctor took throat and nasal swabs and gave me Tamiflu. They suspect swine flu but I will have to wait for the results, which will come after four days. I will need to reschedule my flight to Taiwan." Where is the infrastructure for this?" asked Anand Phadke, co-convener of Jan Arogya Abhiyan in Pune, a coalition of health groups and ngos on public health. A test costs Rs 5,000. If found positive, a confirmatory test is required, which costs another Rs 5,000. While the ministry has not revealed the amount it has spent so far, based on the number of people who went for the tests it is likely to be over Rs 6 crore (until August 18). Then there is the cost of the drug Tamiflu. A strip containing 10 tablets costs Rs 280. The ministry has a stock of 10 million tablets and is planning to stock 20 million more. Thermal scanners have also been put in airports and doctors deployed. So far, 225 doctors and 172 paramedics are manning 83 counters in airports across the country. This, when there is a shortage of doctors in government hospitals. Besides, the country can do without doctors in airports now because the disease has taken root within the country. "It is no joke to provide these facilities to every swine flu suspect. Why should taxpayers' money be misutilized?" asked N S Deodhar, former director of All India Institute of Hygiene and Public Health in Kolkata and a renowned epidemiologist. "If the government keeps doling out freebies to the rich, it will go bankrupt. All the public health money would be spent on free swab testing and Tamiflu, leaving nothing for other more important health programmes on malaria, dengue and tuberculosis." Not everyone needs a test, said Jayant Deodhar, a paediatrician in Pune. "If high fever does not come down despite paracetamol, nausea and vomiting continue, there is diarrhoea and loss of consciousness and a sudden increase in the breathing rate, one needs to get tested for swine flu." The government released screening, testing and treatment guidelines for swine flu as late as August 15. By then, it had spent a lot of resources. In 2008 the health ministry had revised the century-old Epidemics Act and proposed guidelines, which included how to handle pandemics better. No decision has been taken on the guidelines, now in the form of a bill. Four states must demand legislation, said Naresh Dayal, health secretary at the Centre. He added there was no need to panic though. Swine flu's mortality rate is low (see box). Many more children in India die due to diarrhoea, measles and tuberculosis but there is no hue and cry, N S Deodhar said. Debabar Banerjee, former professor of social medicine and community health at Jawaharlal Nehru University in Delhi, agreed. He said swine flu had become a class issue because it affected those who travel abroad and study in public schools. Many maternal deaths take place each day. The maternal mortality rate currently stands at 450 every 100,000 live births per year. Till August 22, swine flu has claimed 50 lives in India and doctors said most of these deaths are because of other underlying problems like diabetes, pneumonia or lung infection. Anita Kar, director of Interdisciplinary School of Health Sciences at Pune University, said the government should have communicated to doctors, both in public and private sectors, healthcare workers, laboratories, research institutions and people, about their role in tackling the virus much in advance. The government had, however, not thought of the private sector till August. It was around then the demand for private test and treatment facilities peaked. Ten days into August health minister Ghulam Nabi Azad requested secretaries and joint secretaries from various union ministries to go to states and suggest measures to rope in private hospitals and diagnostic labs to combat swine flu. On August 12, media reported three private labs in Delhi were included for diagnosing the disease but Naveen Dang of Dr Dang's Path Lab in Delhi said he had not received any confirmation from the government. "Once we receive an intimation we will need four days to get on with the diagnosis. The infrastructure is ready. Each test will cost Rs 10,000 and take two days for the results. We have not asked for any subsidy from the government. If we get it, it will be an encouragement for us," Dang said. Explaining the delay in approaching private players, Pune virology institute director Mishra said the government did not want to monopolize testing, but it was concerned about accuracy of test results. "Our staff is undergoing various international training for the past three months to deal with the H1N1 virus. If proper bio-safety measures are not taken the virus can spread from the lab itself. If private labs demonstrate they have the capacity to test the new strain of virus, the government can evaluate them and decide accordingly." Maharashtra has formed an expert committee to assess private hospitals to treat swine flu. Treatment may be allowed at private hospitals but government hospitals will conduct swab tests, said Sharwaree Gokhale, Maharashtra's additional chief secretary, public health and family welfare. Privatization is not the answer, said Randeep Guleria, professor at aiims in New Delhi. "This is the time for introspection of our public health system. We need to have an outbreak management plan where we set guidelines for each tier of the health system." Meanwhile, the Ministry of Health and Family Welfare has assured three private vaccine manufacturers it would grant them fast-track clearances for clinical trials and marketing of influenza vaccines in the country. The vaccine manufacturers are Serum Institute of India in Pune, Panacea Biotech in Delhi and Bharat Biotech in Hyderabad. This will not be at the cost of safety, said V M Katoch, director-general of Indian Council of Medical Research in Delhi. "Three months are enough to figure out safety of the vaccine. Longer clinical trials are usually undertaken as a norm only because there is time," he said. Flu vaccines are not common in India because they are expensive. "Seasonal flu vaccine costs Rs 1,000 per dose, and every year the vaccine changes as per the prevalent virus. Most Indians cannot afford this," said Jayant Deodhar, paediatrician in Pune. Even if the government produces a vaccine, how will people get it? Will it be free or subsidized? asked Banerjee. "There is no vaccine delivery system in place. And even if the government does put in place a vaccine delivery policy at such short notice, how will it work without a public health policy in place?"